I love recipes which use up the leftover chicken from a roast and quantities don’t really matter too much with this recipe. I ordered my sriracha online then found that it is sold by a local greengrocer/sell everything store so in future I will know where to buy it from. This recipe is not too different from Sesame Chicken Salad with Cucumber Noodles which I posted on 11th April, but the sriracha gives it a nice kick and it uses slightly different ingredients which could be interchangeable. Make the dressing in a large bowl by combining the cashew butter, sriracha, lime juice and a pinch of salt. Whisk well to blend to a thick sauce. I added a little more lime juice to my dressing as it was quite thick. Make your zoodles with a spiralizer (zucchini and carrot), or slice them very thinly. Halve the tomatoes, thinly slice the spring onion and dice the avocado. 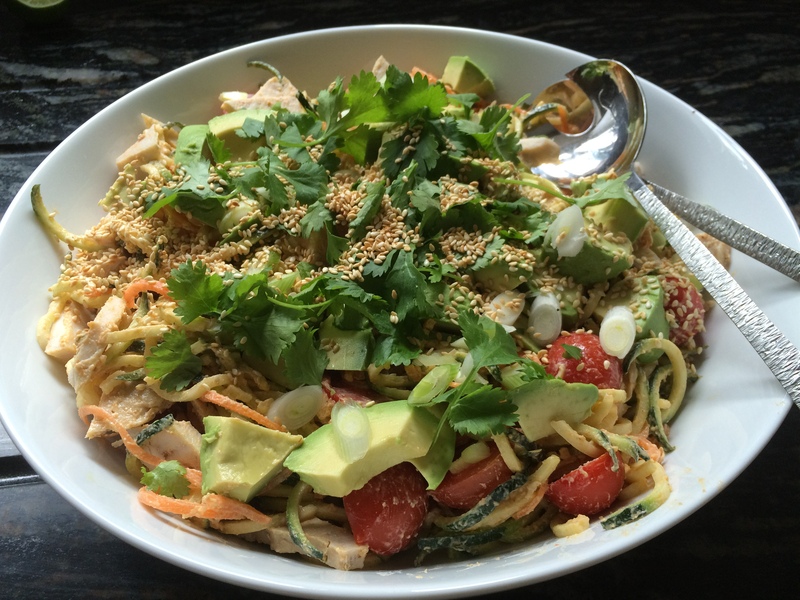 Place the raw zoodles into the bowl of dressing and add the chicken. Toss well to combine. I found it easier to toss with my hands to get the dressing evenly over the zoodles – almost massaging the dressing into the them. Transfer to a clean bowl and top with cherry tomatoes, sliced avocado, spring onions, coriander and toasted sesame seeds. This entry was posted in Brunch, Dinner, Salads and tagged Carrots, Chicken, Courgettes, Gluten Free, Healthy Eating, Salad, Sriracha, Thai. Bookmark the permalink.